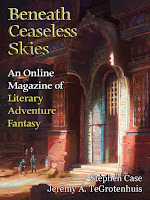 "Deathspeaker," by Stephen Case [bio] (edited by Scott H. Andrews), appeared in Beneath Ceaseless Skies issue 231, published on July 27, 2017. Pro: The story is really about how “Lady Death” (only ever referred to as “she”) became comfortable with her power and learned her real place in the world. The conflict with the Bone King is the most interesting part of the story, of course, and there’s some tension up to the moment when we learn that her power of giving death trumps his power of granting immortality. His biggest weakness is that once immortality becomes a curse, his men defect to her. Con: The larger idea, that the Keeper can see the future of the world in the ice and that somehow Lady Death is destroying the world by using her power, doesn’t really seem to fit very well. The conclusion, which tells us that the Keeper will end up killing Lady Death, is rather unsatisfying. Yup, I was really enjoying this one right up to that last moment. Then it's like, "Wait, what?" It's hard to believe he would be able to kill her too.